As Hwa Chong celebrates its 93rd Anniversary on March 21st this year, the Hwa Chong Alumni Association Youth Chapter has put together a series of initiatives to engage the Hwa Chong family. You may choose to pen down your well wishes and dedications on our online guest book or express your love for the school through both English and Chinese literary fashion in our "Envisioning Hwa Chong" and "愿景.华中" Literary Competitions. 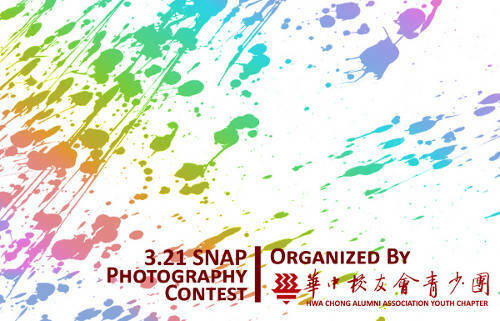 Photography enthusiasts can participate in our 3.21 SNAP Photography Contest and showcase the captured moments of our rich school life and Hwa Chong's majestic landscape. This year, we have added an "Envisioning Hwa Chong" video competition for video enthusiasts. Hwa Chong's 93rd anniversary is coming soon! Tell us about your well-wishes and dreams for Hwa Chong! I wish for Hwa Chong to continue to be the top institution of choice for students in Singapore. May the teachers be as passionate as they always are, continue to nurture students like their own children and produce future leaders of our world. Heres wishing Hwa Chong a good 93rd Annivrsary. May traditions prevail and pride overcome the obstacles that may come our way. May Hwa Chong prosper even more in the future and groom even better leaders! Happy 93rd anniversary HC! All my pleasant memories of school days started with you. Without you, my youth's incomplete. Many thanks, and may excellence continue to prosper in Hwachong! May HC shine brightly for the years to come! I enjoyed my time there and I really miss the old days hanging around our campus @ Bt Timah. Happy anniversary HC, and thanks for all the great memories. hope hwa chong can prosper and continue its great work educating students!! Happy 93rd Anniversary Hwa Chong! Happy anniversary Hwa Chong! Continue to be the best! May the Hwa Chong spirit continue to burn bright and strong, and be the beacon that binds all of us who share common memories. Happy 93rd Anniversary, Hwa Chong; May you soar to greater heights in the years to come! Happy 93rd Birthday Hwa Chong! May Hwa Chong continue to excel for many more years to come! Happy 93rd Anniversary Hwa Chong! With each year passing, it only gets better! YEEEAAAAHHH! Awesome school will stay awesome forever! Incidentally, I'm a '93 baby. I thank Hwa Chong for giving me the best days of my teenagehood. May Hwa Chong live on and continue to produce leaders of tomorrow! May Hwa Chong stay strong and may the Hwa Chong spirit live on always! Happy birthday! It's the pride that you feel whenever you tell someone that you're a Hwa Chongian. The pride of being in the Hwa Chong family. Happy 93rd anniversary Hwa Chong! Once a Hwa Chongian, always a HwaChongian. And I'm proud to be one. Staff, students and alumni of Hwa Chong Institution, Hwa Chong International School, Hwa Chong Junior College and The Chinese High School can submit a type-written Chinese poem, song lyric or short essay between 300 to 500 words with the theme "愿景.华中". Staff, students and alumni of Hwa Chong Institution, Hwa Chong International School, Hwa Chong Junior College and The Chinese High School can submit a type-written English poem, song lyric or short essay between 300 to 800 words with the theme "Envisioning Hwa Chong". Closing date for entries is on 11 March 2012 (Sunday) 11:59 pm. Submit a short video between 100 seconds to 200 seconds that reflects the theme “Envisioning Hwa Chong” and encapsulates a futuristic Hwa Chong. You can upload your video to youtube, vimeo, facebook or qik. Simply send us the video URL! All submitted videos will be displayed for all to see. Note: If you upload your video to Facebook, make sure your privacy setting for that video is set to "Public". Submit a link to your video to contact@hwachongyouth.org.